The distribution, mineralogy and mobility of the platinum-group elements (PGE) in the surface environment are poorly understood. 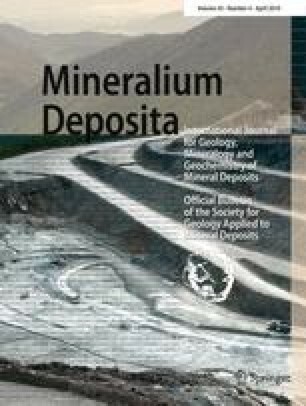 This study of the lower, less altered and upper, more altered gossan, overlying the Aguablanca Ni–Cu-(PGE) magmatic deposit (Spain), has shown that the platinum-group minerals (PGM) are progressively oxidised and dispersed into iron oxides that form the gossan. A combination of the characterization of PGE in host PGM, using a scanning electron microscope, and measurement of PGE at lower concentrations in host iron oxides, using laser ablation-inductively coupled plasma-mass spectrometry (LA-ICP-MS), has for the first time allowed the total distribution of the PGE within a gossan to be documented. This study has revealed a complete in situ alteration and dispersion sequence of the PGM including (1) breakdown of both the more stable Pt-arsenides, Pt/Pd-tellurides and the less stable bismuthotellurides, (2) formation of partially oxidised PGM, (3) development of a wide range of oxidised Pt- and Pd-bearing phases, (4) subsequent formation of Fe–PGE-oxides and PGE-hydroxides, (5) incorporation of PGE into ferruginous supergene products and lastly (6) concentration of PGE at the edges of veins and iron oxides. Dispersion of Pd is greater than for the other PGE with Pd being widely distributed throughout the iron oxides. This oxidising environment produced PGE-oxides rather than PGE-alloys, also commonly found in the surface environment, especially in placers. These results provide critical evidence for the stages of mineralogical change from PGE host mineralogy in magmatic ores to surface weathering producing PGE-oxides. The online version of this article (doi: 10.1007/s00126-009-0275-x) contains supplementary material, which is available to authorized users. The authors would like to thank the staff from Rio Narcea Recursos S.A. for allowing access to the Aguablanca mine and for their assistance during the field studies. Technical support from SGIker (Ministry of Education and Science of Spain, Basque Government, European Social Fund, University of the Basque Country) is also gratefully acknowledged. Thanks are also extended to Dr. I. Yusta (UPV). Drs. Thomas Oberthür and Fernando Tornos are exceptionally thanked for their detailed review of the paper and Dr. Bernd Lehmann for handling the manuscript. Financial support was supplied by the research projects CGL2005-00798/BTE (Ministry of Education and Science of Spain) and IT-446-07 (Basque Department of Education, Universities and Research) and by the research fellowship AP-20034667 (Ministry of Education and Science of Spain).